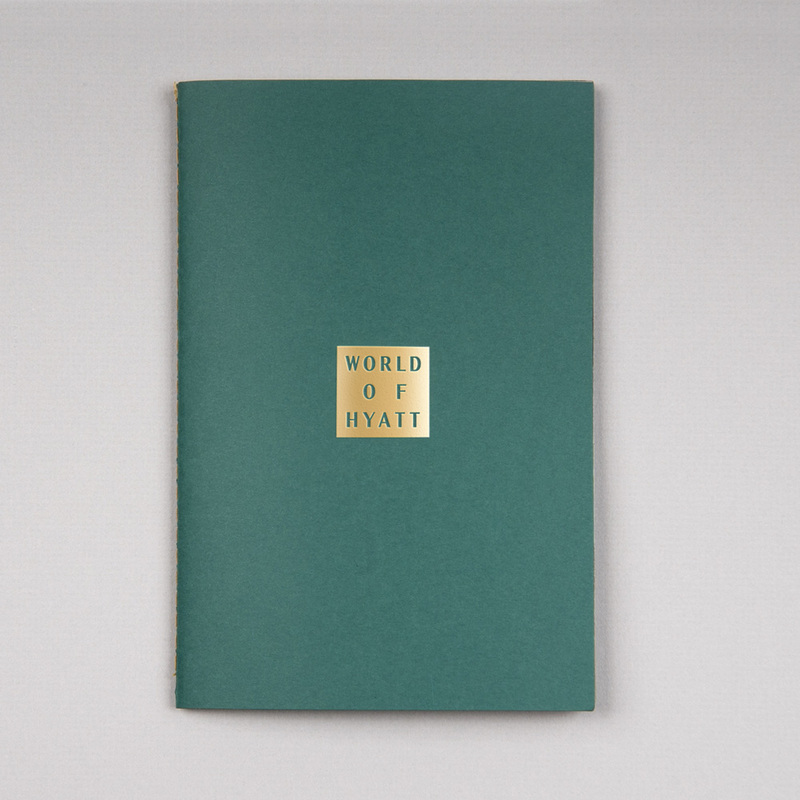 Previously known as Gold Passport, World of Hyatt is the rewards program of Hyatt Hotels Corporation and its portfolio of over ten hotel brands. 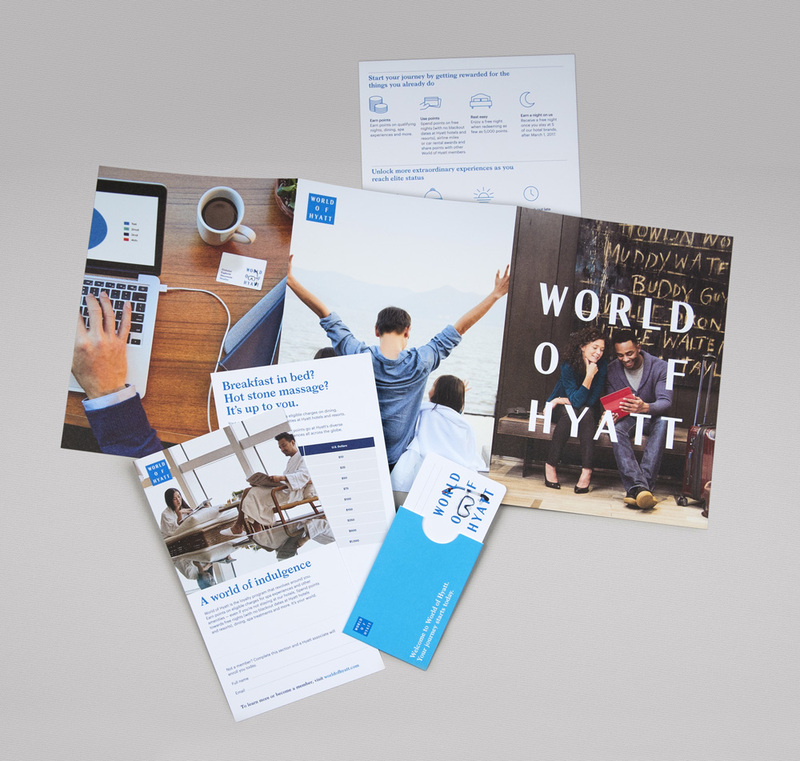 There is not much point getting into a deep explanation: You earn points the more you stay at Hyatt properties, that earn you better status and are redeemable for hotel use or other shopping. 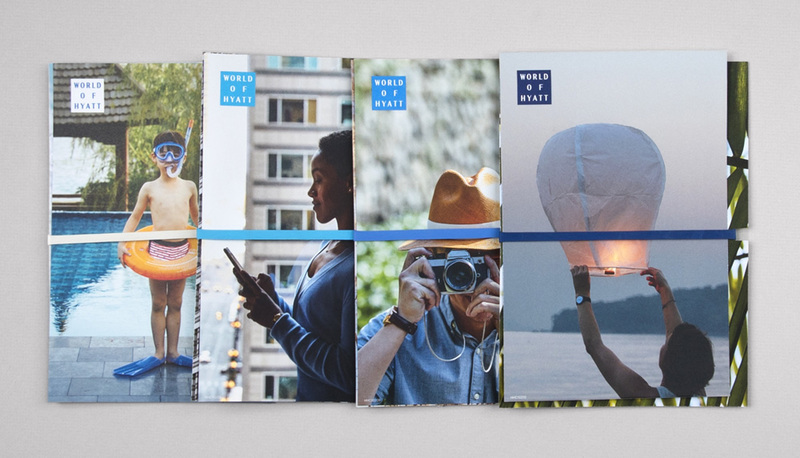 The name change was announced last summer and the new program started this month with a new identity designed by Wolff Olins. The old logo wasn’t much; just the main Hyatt logo with Gotham underneath, which was fine but unexciting and perhaps too corporate-looking, making it feel more like an employee-benefits program than a jet setter’s. 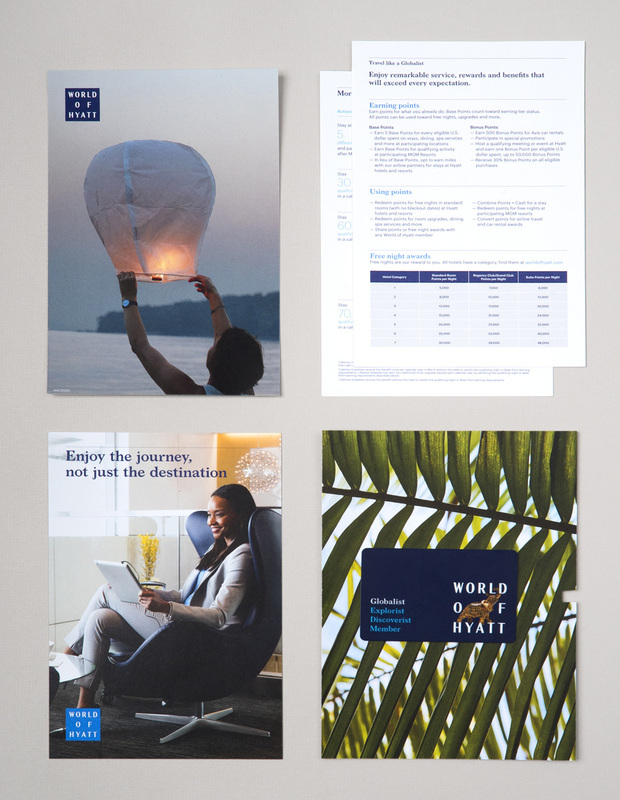 The new logo gives the rewards program its own, standalone brand that builds only on the equity of Hyatt name but not the logo, making it more independent. The logo is fairly straightforward with a nice contrasted sans serif that’s unusual in its more condensed structure and thick-and-thin relationship that sets it apart from the avalanche of geometric sans serifs. 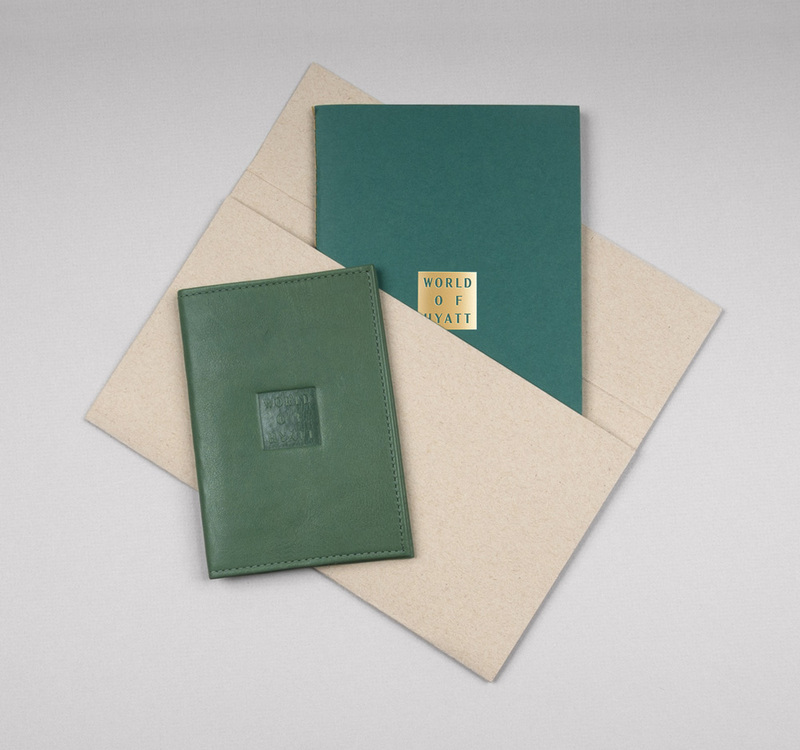 It has a classic feel that makes it look upscale but not overly stuffy. The most visible graphic trait, though, is the monospace approach to “OF”, which I think you will either love or hate… I’m heavily undecided and my main concern is that I keep wanting to read something vertically but all I’m left with is “OOY” or “LFT”. That “OF” opens up to the edges to accommodate graphics is kind of interesting, but I wonder how many times that really happens in application and, of those times, how many does the end user realize that what the logo is doing is on purpose and not a confusing mistake? The opened “OF” looks best when it frames people faces than when it does objects, as the knocked-out objects start to look cheap. Still, for a rewards program, it’s one of the more interesting and ambitious logos out there. In application, the identity introduces a great serif, Larish Neue, that makes for an odd but nice complement to the logo and somehow gives the program a more worldly aesthetic. The big, low-contrast photos also add an engaging touch to the identity. 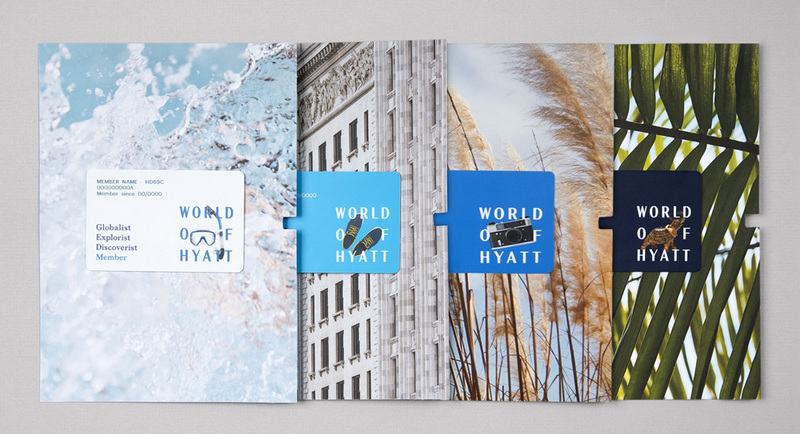 Overall, this does a solid job in creating a tangential, complementing brand to Hyatt that feels like an insiders club but without too much pretense (just a little) while looking crisp and contemporary. Thanks to Billfred Leverette for the tip.